Edmund G. "Jerry" Brown, Jr., the son of former Governor Pat Brown (1959-1967), was born in San Francisco on April 7, 1938. He graduated with degrees in Latin and Greek from the University of California, Berkeley in 1961 and received a juris doctorate from Yale in 1964. His education also included studies at the Jesuit Seminary in Los Gatos, California. Following law school, Brown worked as a law clerk to California Supreme Court Justice Mathew Tobriner, traveled and studied in Mexico and Latin America, then took up residence in Los Angeles, working for a law firm. In 1968, he helped qualify a slate of presidential delegates to oppose the re-nomination of President Lyndon Johnson. The following year, Brown was elected to the Los Angeles Community College Board of Trustees. In 1970, Brown was elected California's Secretary of State, a position he held until his inauguration as Governor in 1975. As governor, he had strong ideas about state spending and refused to live in the new governor's mansion, renting a modest apartment instead, and nixing the governor's limousine in favor of a state-issued Plymouth. He focused on energy efficiency and alternative power sources, sponsored and signed the first labor laws in the United States to protect farm workers, and signed into law the California Conservation Corps (CCC) program. His appointments emphasized minorities and women, echoing the social awareness of his era. 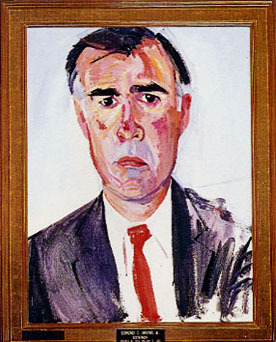 After his two terms as governor, Brown unsuccessfully ran for United States Senator in 1982. He then travelled extensively, returned to his law practice in Los Angeles, and in 1989 became chairman of the state Democratic Party. He resigned that position in 1991, and unsuccessfully sought the 1992 Democratic Presidential nomination. In 1998, Brown was elected Mayor of Oakland, California. Brown was re-elected in 2002 and held the post until 2007. Brown was elected Attorney General of California in 2006 and announced his candidacy for Governor in March, 2010. Since Brown's previous terms in office were not covered by term limit laws enacted in 1990, he was not barred from running for Governor again. Jerry Brown is the only governor to return to the office after serving years before.